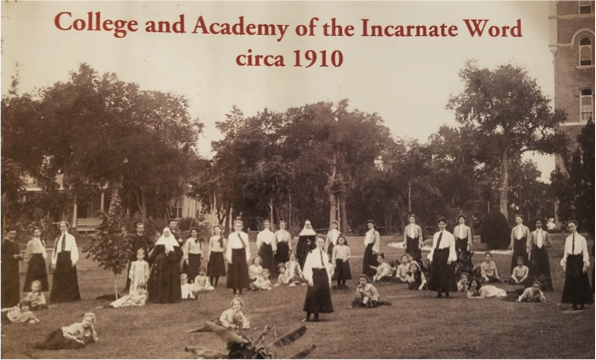 Though the Incarnate Word Sisters did not have enough money to purchase the land around the Headwaters of the San Antonio River from Col. George Washington Brackenridge in the late 1890’s, they worked very hard to raise money over a period of years believing that being close to nature is educationally beneficial and spiritually renewing. People need to learn of nature and learn to care for nature. February 17¸ 2018, 9 am. to 12 noon: Growing the Infrastructure of the Community Gardens creating pavers, staining wood, and fixing up - Open to 25 volunteers. During the San Antonio Commemorative Week on May 2, 2018, see UIW student posters on “Sustainability at UIW” in the University Student Tricentennial Poster Exhibit at the Institute of Texan Cultures coming from the Inter-University Higher Education Subcommittee of the SA 300 History and Education Committee. August 4, 2018, 9 am. to 12 noon: An Educational Support Opportunity open to teachers K through 12 to start community gardening and develop experiences for students based on required learning outcomes. Open to the first 25. October 13, 2018, 9 am. to 12 noon: An Environmental project in the community gardens in the fall planting season touching the earth and learning of its potential gifts. Open to 25 people. On the Incarnate Word Campus, we have oak trees that go back more than 300 years. Before the Spaniards spoke the name “San Antonio” for the beautiful wooded area by the glistening water in 1718, the oaks near the headwaters of Yanaguana, the river, were growing. We are also strengthened by the roots of compassionate care for the sick, the orphans, and the uneducated which started in 1869 when the first three Incarnate Word Sisters came to San Antonio in response the mayor’s plea for help. We were founded in civic engagement. We continue with care for creation and continue developing innovative and compassionate service in light of today’s pressing needs. UIW already has a “Solar House” built by Engineering students where other students are learning basic ideas and skills in regard to sustainability. The Engineering Department is in the process of building a windmill on campus so that students may appreciate and learn about wind energy. UIW aims to have at least 300 hours of service to sustainability initiatives done by various students throughout 2018. We are “growing a legacy of service” with many branches of community gardening, a pollination garden, rooting out invasive species and nurturing native plants, documenting trees, on-going research, and other things.